I sewed a lining into the jacket I showed you in the last post, and thanks to the feedback from all the lovely ladies at the ASG sewing group at Rhodes on Saturday I've decided that this jacket is completed and is good enough to wear - a great outcome for what was essentially a test version. I travelled into work this morning with my husband and I forced him take some photos for me next to an old sandstone building near our offices, so you all get a different background than my usual lounge room. I wore it today with a black dress I'd made pre-blogging days (Vogue 8280), so it's too bad I'm not doing MMM because I nailed it today. The jacket was very comfortable and kept me warm on a chilly day and it wore so much better with a lining as it didn't catch on my clothes at all. It does need some slight fitting adjustments for the next version - mainly a forward shoulder adjustment and a bit more interfacing, but overall this one is still pretty good. excuse those squinty eyes - it was early morning and I'm soooo tired! Making a lining for it wasn't that difficult either, and whilst I don't particular like doing tutorials since I'm not an expert in these things (my pet hate is newbie sewists doing tutorials on their blogs) I will share how I did here partly because BeaJay asked me on Saturday but mainly so that when I go to do this again I remember exactly how I did it! First up the fabric - back in 2011 when I wondered what fabric to use to line this New Look 6000 dress I made from ponte, a few people suggested a stretch knit fabric so I picked up a roll of black stretch knit from the Remnant Warehouse on one of their two for one rolls Tuesday, which has a soft, slippery hand almost like fabric you would use for a slip. I still haven't lined that purple ponte dress yet, but the fabric is perfect for lining this jacket. It does have more stretch to it than the ponte I used for the outer fabric, but I figured that would be fine. Next the pattern pieces - for the lining I used the side front, sleeve, back peplum and back pattern pieces as drafted. I didn't add a pleat to the back pattern piece for wearing ease that you would normally see in a jacket at the neckline because I made the lining from stretch fabric. I drafted new pattern pieces for the front and front peplum. For the front peplum lining pattern piece I made a new pattern piece by folding over the centre front facing bit and folding the dart over too and added a seam allowance to the centre front, so that I had a pattern piece that was the same shape but much narrower. Finally the construction order - I sewed all the lining pieces together, and then sewed the lining to the jacket at the collar/centre front and the sleeves ends (not the cuffs). Then I hemmed the jacket (2cm deep) and lining (3cm deep) separately to each other so that the lining would hang freely which I figured was the best way to deal with the pleated fabric at the front. I sewed the lining to the jacket on the inside along the waist seam allowance just to anchor the lining in place and so it wouldn't twist around when being worn. Then I sewed the cuffs back on, not bothering to sandwich the raw edges in the middle of the cuff layer because it won't be visible and I was feeling lazy, but next time I probably would just to make it look better. And that's all it took - pretty easy really and I still can't understand why the pattern didn't include a lining. Very pretty jacket. Great work. I really like the lines of it; may have to order it to add to my SA collection. Love the jacket! The cuffs are so cute The fabric is fantastic! Is it a new purchase? The jacket turned out beautifully! I'm so glad the lining worked out - I'm sure it will get a lot more wear. This looks very nice on you! I'm glad you went to the effort of lining it, I think it really made a difference in how nicely it wears. I notice the button placement is right at the seam attaching the bodice to the peplum--have you thought about trying an in-seam/slot buttonhole in that seam? Oh Kristy it turned out so smart! Looks as if you have just made it reversible!It seems to hang/lay much nicer now too. Nothing like having a lining to add a bit more warmth. Sometimes that's all we need. Great job! What a nice work jacket this turned out to be! Navy looks great on you and is sure to go with lots from your wardrobe. Nice job on the lining too. This jacket is just so smart. Thanks for the lining tutorial. 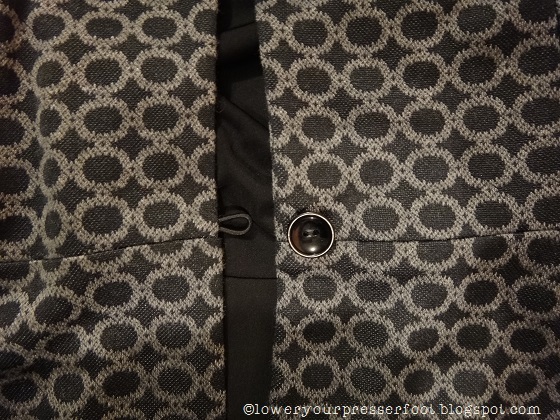 My plan is to make a lined jacket by the end of the year, and this post will be useful. You nailed it alright! That lining is so good you could almost wear it as a reversible! I am thinking of doing another Marnie at my upcoming sewing weekend and I may well line it using your instructions! Thanks Kristy. It looks awesome ... so flattering and the lining just improves the jacket. I agree totally about a jacket needing lining, Kristy. You've done a fabulous job adding the lining without instructions. I love the style... very feminine and flattering!!! If you don't mind me asking, where is the Remnant Warehouse? It sounds like it would be well worth a visit. Kristy, the finished jacket looks great, the lining has made a big difference and paired with your black dress its gorgeous. Amazing jacket Kristy the fit and style really looks great on you and thank you for the tips on creating the lining for this jacket. You have nailed it. I like the button feature too. You've done a great job with the jacket. Perfect fit and love the patterned ponte. How did I miss this? You did a fabulous job on this jacket and I'm sure more will show up in your wardrobe. Nice photo of you wearing the outfit too!